You have worked your way through over 120,000 US foundations to find the best foundation funding prospects for your organization (see my previous blogs on how to determine your best funders, and my review of some of the tools available to do this). Now, you need to answer a crucial question: how much do you ask for from each funder? It’s a question that every fundraiser needs to ask, and more importantly, needs to have the answer to. In this week’s blog post, we’ll review the problem, do a web survey of the prevailing wisdom, and then outline some of the possible solutions. You may be asking yourself why you should not just simply ask each of your funding prospects for the amount you need to fund your project. The answer is that foundations have both “floors” and ceilings” on the amounts they give — a request that is too small may be deemed too expensive for the funder to oversee relative to the amount donated; too large a request may exceed the funder’s capacity to give. To compound the problem, these floors and ceilings vary by funder, your area of operation, your non-profit category and other factors including the size of your proposed outcome. There has been little discussion in the sector on the topic of ask amounts for foundations. A survey of some of the advice available online about optimal ask amounts reveals that most advice is geared toward individual giving capacity — how much to ask from individual donors. From blog posts at DonorPerfect (“the secret to asking the right amount”), to gift range calculators from Blackbaud, most of the guidance and recommendations center around how to deal with individual giving. Some of the suggestions can translate to the world of foundation fundraising, but some of it simply doesn’t apply. FoundationSearch is working to take some of the work out of this process, by providing a method of calculating the ideal ask amount automatically, for each funder. Built into its analytic tool for finding the “best funders” for your project, a recommended ask amount is calculated on a foundation by foundation basis by your stated funding category and location. The system reviews the entire granting history for each of your foundation prospects, selects the historic grants that most closely match your project parameters, and calculates the median, maximum and minimum grant amounts made by the funder. 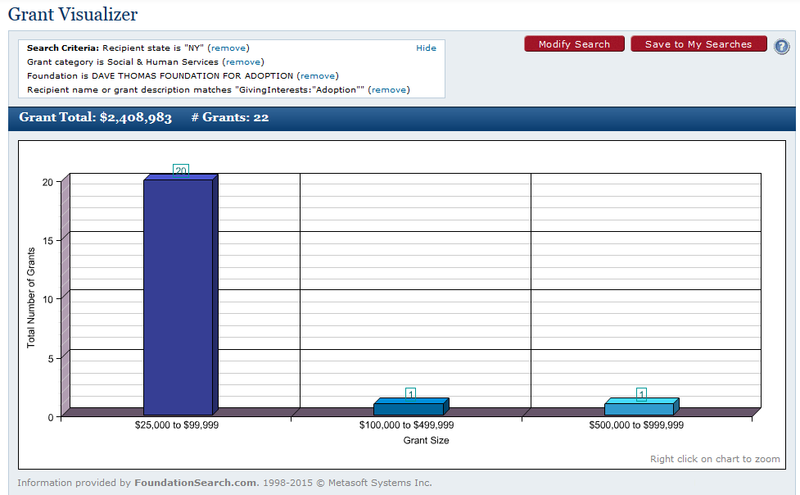 The median (middle) grant amount is selected as the “recommended ask amount.” Users can click the amount, and easily view a chart (like the one shown above) of the relevant historic grants and see in which range most of the grants fall. By asking for a grant amount that is in the middle of the amounts previously granted by the foundation, you lessen the risk of your request being rejected, and you stand a better chance of securing the grant from the foundations you approach. With a list of the best funders, and the optimal amounts to ask from each funder, you are in a much better position to succeed in your fundraising efforts.